It’s one of the 3 reserve fuel types generally required on any #flight (plus alternate & final reserve fuel). Sometimes called “enroute reserve”, CONT is planned to cover any unforeseen deviations on the way to the the #aircraft ’s DEST – e.g. re-clearance on a different route / #flightlevel by ATC, or WX avoidance enroute. 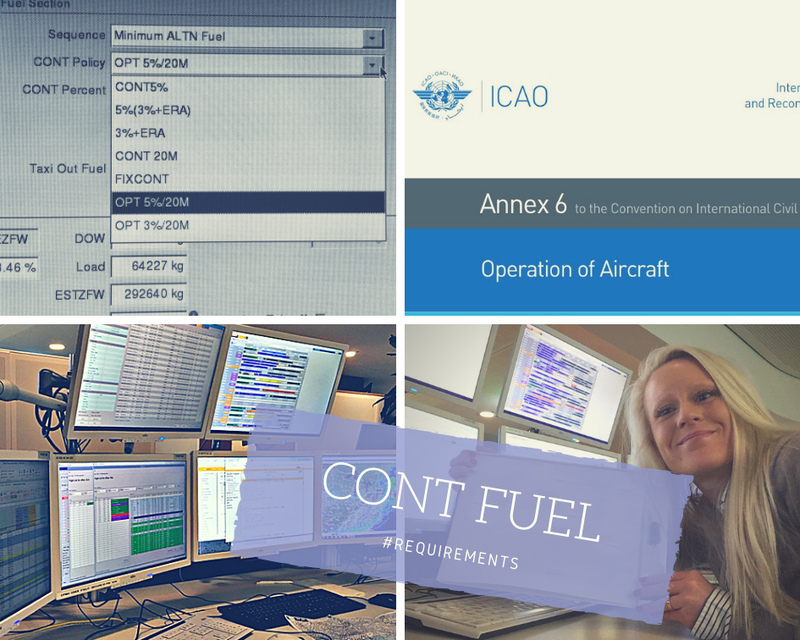 According @icao Annex 6, CONT is the greater of fuel for 5 mins holding at destination (ISA conditions, 1500ft overhead, expected gross weight) – aka MINCONT; and 5% of trip fuel, up to 20 mins. Local authorities have added some (mostly less conservative) options for CONT calculation to the basic @icao standards – all of course require certification before an operator may use ‘em. Instead of 5%, it’s possible to apply 3% of trip – if defining an additional “Enroute Alternate” (ERA), located along the route at ~ 75% flighttime. Fixed amounts of CONT, or statistical values (from evaluating actual use of CONT) may also be granted. So, during #flightplanning, we #FOO choose the CONT policy for each flight: MINCONT or 3% (+ERA) or 5% of trip or 20 mins. MINCONT is always required – even on a hop like FRA-MUC; if flighttime exceeds ~9-10 hours, CONT calculation delivers the 20 min maximum. Depending on availability / suitability of possible ERA (… and yes, we check these for NOTAM and WX too ☝🏻), we may apply 3% in between. If something seems fishy during planning, we can opt for the 20 mins right away (e.g. wide spread WX en route). CONT can be calculated as “protected” – assuming the whole amount is carried to the destination (e.g. if holding there seems likely); this means trip fuel increases further to transport the additional weight. Feeling bold? Just set the 5 mins MINCONT (for holding over dest) as “protected”. the remaining amount then is “open” or “unprotected” CONT – and will be gradually “converted” to trip fuel along the #flightpath. effectively carrying MINCONT for a long-haul to reduce T/O weight. Taking complex provisions in #flightplanning, this could be my next guest..? !